How many miles is the trip? How many tolls will you encounter? Approximately how much gas will cost. Once you get an idea of these things, you can start looking for deals that can save you more money. For instance, booking a hotel in March might save you more money than booking in May for a trip in June. Purchasing an EZ pass might save you more money than paying for toll. You can also find deals and discounts on attractions along the way to make the trip more exciting. If road trips happen to be common in your household, then you might want to consider buying or financing a vehicle as opposed to renting one. Over time, you’ll end up saving a lot more money. Since my family and I go on road trips at least three times a year or more, it was better for us to finance a recreational vehicle than it was to keep renting vehicles or putting the wear and tear on our cars we use for regular transportation. If you’re going to take this route, be sure to review the various service providers for an easy and affordable RV loan. If you’re not going to buy or finance a vehicle, you should still shop around to find out where the best rentals are so that you’re not spending more than necessary. When selecting a vehicle for travel, you want to make sure that it is large enough to provide comfort for everyone going on the trip. The more comfortable you are, the more enjoyable the ride is. If you’re going to be driving for a long time, it’s probably a good idea to pack a few meals to take with you. Stopping off for takeout is not only time consuming but can add up pretty quickly. There are plenty of quick recipes you can find online for nice family meals and snacks you can pack to take with you. Sandwiches, chicken nuggets, and lots of fruits and veggies can work well – especially for the children. Packing meals or bringing groceries along with you is also a great way to save money once you’ve arrived at your destination. Many hotels have microwaves, refrigerators, and some even have small kitchens in which you can prep meals. Since eating costs can really add up, cooking a meal prior to heading out for the day will save your family money that can be used on purchasing souvenirs or participating in other activities. Did you know that there are applications that will help you find the cheapest gas station? Utilizing this on your road trip can save you a ton of money on gas. Of course, you don’t want to travel too far off your route, so make sure that the gas station you select is on the way or just a little out of the way. You’ll want to save the more expensive attractions and entertainment for when you’ve reached your destination, so finding cheap things to do along the way saves you money. Within every community there are websites that will display the free and affordable things to do in the area. This might include local parks, museums, festivals, and other community events. This is a great way to expose your children to other neighborhoods and forms of entertainment. Road trips don’t have to cost you an arm and a leg. With proper planning and the frugal tips listed above, you should have no problem in planning a trip that won’t break the bank. Then you can have peace of mind as you travel the country with those you care about visiting the places you always dreamed of. 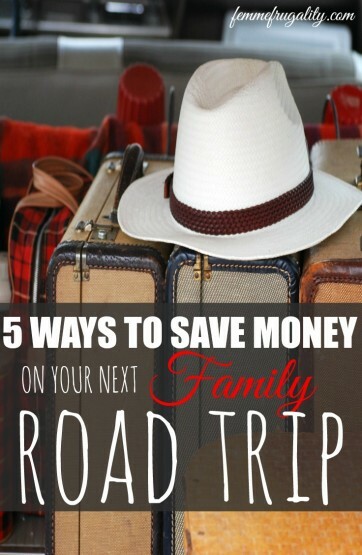 This entry was posted in travel, Ways to Save Money on March 4, 2016 by femmefrugality. Tim and I don’t take a lot of road trips because of health issues and because I don’t love putting a bunch of miles on the car, since we’re a one-car household. But sometimes we drive over to Vegas for three days. Always with snacks, of course. And do t forget to load up your MP3 player with good road songs! I had Tim belting out songs from The Chicago soundtrack, which is a priceless memory all on its own. Well Vegas sounds fun! I do the same thing with music… I use YouTube playlists now for the ultimate free. These are some great tips! I haven’t gotten to go on a road trip in a good while, but next time I do, I’ll be thinking of this list. Especially the planning ahead part! I took a road trip last summer where I planned very poorly, and I definitely paid more for it! Since I travel quite often, I’ve found EZ Pass to be a lifesaver when it comes to expensive tolls. GasBuddy is also pretty cool – that’s what I use to find the cheapest gas. If I know that a particular gas station is on my route, I’ll hold out. Some places will have an additional discount for cash only, which I love. Like, credit is $1.70/gallon while cash is $1.60/gallon. Whhhaaat? I had no idea about the cash discount!